Tidewater Community College’s Sandra Itliong-Bowman plans a career in human resources and will transfer to either Old Dominion University or the College of William and Mary after graduating with an Associate of Science in Business Administration in May. Her desire to help others in the workplace stems from her father, Larry Itliong, whom she and her family will honor this weekend at the first annual Larry Itliong Day, held in Historic Filipinotown in Los Angeles. Itliong-Bowman will be the keynote speaker at a festival celebrating her father’s role as labor leader and organizer in the 1960s during the Delano grape strike. October is Filipino American History Month. Larry Itliong, who would be 102 on Sunday, led the labor union action initiated by 1,500 Filipino-American farm workers. The movement lasted five years and led to the first law in this country governing organized farm workers. What resulted was protection for farm workers like her father, who at 16 came to this country and started as a laborer in lettuce fields, where pay was minimal and conditions deplorable. 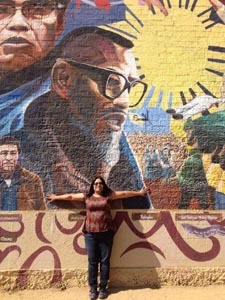 “My father didn’t have the education of most Americans in our country, but he had the heart, soul and determination to get what his people were entitled to, which were fair wages and better working conditions,” said Bowman-Itliong, whose father is dead center of a mural in Filipinotown depicting significant movements in California history. Itliong-Bowman credits her public speaking class at TCC with giving her the confidence to deliver Saturday’s address, which shares her memories of the man who frequently had his only daughter in tow during his tireless efforts to work to better the lives of Filipinos. Itliong-Bowman came to Hampton Roads to care for her granddaughter Paige during her daughter’s deployment. When Paige became school age, Itliong-Bowman decided to realize her own college dream, enrolling at TCC.